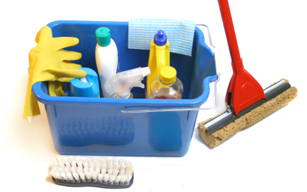 Our everyday housecleaning products can be toxic to the environment. When you dump a can of paint thinner down the drain or throw out an old car battery with the trash, the impact on your water resources could be disastrous. The average household contains between three and ten gallons of materials that are hazardous to human health or to the natural environment. Collectively, these materials can poison our water if they are not stored carefully and disposed of properly. The improper disposal of household hazardous wastes can cause problems for the entire community. Wastes can be explosive, highly flammable, or corrosive. For example, the acid from discarded auto batteries can eat away many substances. Some wastes are poisonous to humans or wildlife, while others can cause cancer, birth defects or other serious medical problems. One of the worst ways to dispose of many hazardous materials is to “just dump them down the drain.” Wastewater treatment plants are not designed to handle certain types of hazardous wastes. Unfortunately, disposing of wastes in a landfill has not proven an effective solution either. Without special design, the modern sanitary landfill is not equipped to accept hazardous wastes. Hazardous wastes improperly disposed of in a landfill can pollute the environment through the groundwater, surface water and air. Phosphorus is a nutrient essential for plant growth. It is found in lawn fertilizers, some detergents, and human and other animal waste. Too much phosphorus in water causes algal blooms and excessive aquatic plant growth. These plants, and the water quality problems that occur when they decompose, can harm fish and other organisms and limit our use and enjoyment of local lakes. While phosphate is banned in laundry soaps and hand dishwashing detergent, it is still used in automatic dishwasher detergents. Use safer substitutes when available. Try out one of our recommended alternative cleaners or homemade recipes for non-toxic alternatives listed below. Check the Westchester County Material Recovery Facility schedule to see when and where to recycle your household waste. Five basic ingredients serve as the building blocks for many safe, non-polluting home-cleaning needs. Click on the topic below for non-toxic alternatives and recipes.